Originally from Wales, director John Williams has lived in Japan for 20 years. His 2006 film Starfish Hotel, which has just been released on DVD, was an East meets West atmospheric fairy tale that played with cultural borders as well as those between dream, fantasy and reality. In an email interview, he told Richard Badley about in-between-ness, unravelling stories, Haruki Murakami and being like a Minotaur. Richard Badley: Western audiences are used to seeing Tokyo as all neon lights and futuristic skyscrapers but in Starfish Hotel it seems almost bland. Could you tell us about your approach to the city in the film and what you wanted to say, if anything, about its culture? John Williams: I wanted to deliberately avoid all the clichéd shots of Tokyo, such as the blazing lights of Kabukicho from Lost in Translation and the Shibuya crossing from every commercial shoot. These two areas seem to dominate in Western images of the city, and they are the places a lot of people go to have fun, but Tokyo is a huge, sprawling city, and can be very grey and ugly. This was as much as anything about the psychology of the central character, who is trapped in a cold, geometrical maze. The present day in the film is all washed-out and cold and we chose locations to reflect his depressed state, whereas the past, represented more by Taisho period architecture, is warm and full of reds and woody browns. This was not political nostalgia, but the nostalgia of the character, but I also wanted to suggest that all the concrete, glass and sprawl represent a kind of death of the soul. This is a motif in much recent Japanese cinema too. RB: What led you to make the film in Japan? JW: I’ve lived and worked in Japan for 20 years and am now a Permanent Resident, though I still have a UK passport. The question always comes up, but the easy answer is ‘because it’s where I am’. A year before the shoot a UK producer tried to persuade me to reset the film in the UK. It could be done, and I did tinker with a script, but I always felt the story made more sense in Japan and the locations and the references felt very Japanese to me at least. (Strangely, many people in the audience outside Japan found the film very ‘Western’ and some people in Japan talked about the strange ‘in-between-ness’ of the film. They felt they were seeing a slightly wonked version of reality, which was the intention. In the end, the film is very personal and very much about my own first few years in Tokyo. I had lived in Nagoya for 12 years and moved to Tokyo after my first film (Firefly Dreams). Tokyo was a real shock, because Tokyo is not really representative of Japan in so many ways and I felt very isolated and alienated. The darkness of the city scared me. When you’ve got all that artificial light, you also have a lot of shadows too. RB: After Firefly Dreams, what drew you to doing a much darker/noir story? 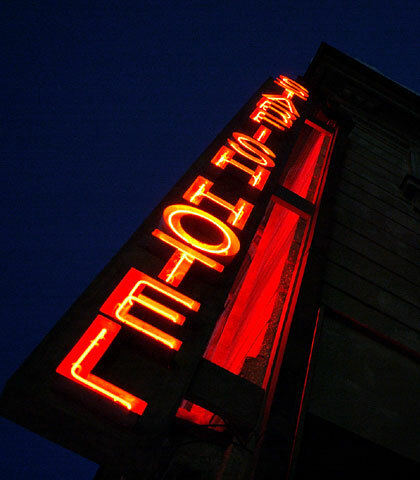 American noir seems to be a central influence in Starfish Hotel so was it a risk doing such a film in Japan? JW: It was a big risk to do this film. I didn’t know that at the time. A sensible choice would have been to do another Firefly Dreams with a slightly bigger budget. It was just that I had moved to Tokyo and this led to an obsession with noir and Japanese ghost stories. I really felt I wanted to blend the noirish elements in Kwaidan (traditional Japanese stories of the supernatural) with a detective fiction. Of course I was reading Murakami avidly and the strange limbo he describes seemed so accurate about my own experience and the city of Tokyo. RB: The central plot about finding Chisato seems linear enough but it’s surrounded by many ambiguous elements. How difficult was it writing the script? Did you rearrange things in post-production? JW: The plot is very simple. A man’s wife disappears. He goes to look for her, goes through the usual tropes of the detective quest and finds her, whilst thinking all the time about another woman. What I wanted to do though was open up big puzzling holes in the story, so that all the time you’re really wondering whether you’re putting the puzzle together or not. This ambiguity is where we live now and perhaps it’s really where we’ve always lived. We make up these stories to explain our world and our experience, and they constantly unravel. I like that unravelling. The edit is pretty close to the script. The film was supposed to have a dream logic rather than a linear plot logic, but this is hard to pull off. RB: There are many themes at work in the film – escapism, authorship… What was it in particular that you wanted to explore? RB: The film’s central tension is between Arisu wanting to be a writer and Kuroda who is constantly watching him, controlling the story. Were these characters inspired by your own life as you became a filmmaker/storyteller? Or was it maybe a comment on the power of authors? JW: When you write something you create a universe that you control, but very often, when the writing is going well and you let your unconscious work, then ‘something else’ takes over. This is both terrifying and exhilarating. I’ve had that feeling a couple of times and I know many writers who have it. This ‘something else’ can completely destroy the mask you wear everyday, so it’s not a great place to stay, but everybody wants to go there. Don’t they? RB: You’ve cited Haruki Murakami as a major influence and the film demonstrates a similar concern about modern society. What do you respond to in his writing? JW: I think what I respond to is his openness to his own unconscious. Murakami is a writer who lets the ‘something else’ speak through him and this is very disturbing. Perhaps this is why he is so disciplined about his writing and his running. He needs to control every other aspect of his life in order to let the big beast free at the back of his mind. I think he also thinks Japan has buried the beast too much and he’s letting it back out of the bag. RB: Were you conscious about making the film as universal as possible by combining elements of Western and Eastern culture (Alice in Wonderland, the symbol of the Fox)? As a result have you had different reactions from Western/Eastern audiences? RB: You’ve been very successful in moving East, what are the challenges and benefits of working in Japan as opposed to somewhere like the UK? JW: Of course the biggest challenge is the language. When you work in English everything is faster. On the other hand, you get this really exciting sense of always learning, which is easy to forget in the UK. I love UK cinema, but the UK film industry sometimes seems almost as inward-looking as the Japanese industry. If anything, I think the Japanese filmmakers I know are looking out more at the world these days, but their work is less known, because of the language barrier. There are more films made here every year (over 400 a year) and Japanese films have a bigger share of the domestic market (50%), but the budgets are lower, there is little soft money, and not much training. The majors dominate everything, but the indie sector is vibrant. I’d love to make a film in the UK one day, especially in Wales, where my home is.